A crowd of 1,2501 was on hand to watch the Philadelphia Phillies demolish the Louisville Colonels, 29-4, on August 17, 1894, breaking the National League records for runs, hits, and total bases in a game. Sam Thompson, playing as part of the “only major league outfield of future Hall of Famers who had all three fielders batting over .400”2 in the same season, hit for the cycle for the Phillies, in a 6-for-7 performance. Thompson batted .415 in 1894, playing right field for the Phillies. Ed Delahanty played left and batted .404 for the season. Patrolling in center was Billy Hamilton, and he batted .403. Philadelphia, the home team, batted first in the game. The Philadelphia Inquirer noted that the Phillies “made the largest score in any championship game this season and the largest number of hits and total bases.”3 Every Philadelphia batter had at least one hit and every starting player scored at least one run. The Phillies tallied runs in every inning except the second. And by batting first, Philadelphia had nine turns at the plate, adding four runs to their total in the ninth inning. At the end of the first inning, they had already scored enough runs to win the game, as their pitcher, Kid Carsey, limited the Colonels to four runs on eight hits. According to the Louisville Courier-Journal, “Louisville could do nothing with Carsey’s curves.”4 For Philadelphia, “[T]he Phillies knocked Wadsworth’s delivery all over the field and sometimes out of it, and, aided by the poor fielding of the visitors, scored runs pretty much as they pleased.”5 Amazingly, the box score listed Philadelphia as scoring only 16 earned runs (meaning 13 were unearned)! Sam Thompson hit for the cycle, getting six hits in seven at-bats (three singles, a double, a triple, and a home run), good for 12 bases, “his longest hit being a home run which bounded over the fence from the bicycle track in right centre field.”6 He also scored four runs. Even though the Phillies collected 36 base hits, they had only five doubles, one triple (by Thompson), and two home runs, for a total of 49 bases. That means that the Phillies pounded out 28 singles in the game. For Philadelphia, Joe Sullivan and Mike Grady each had five hits (four singles and a double) in the thrashing. Hamilton knocked five singles, while Carsey and Delahanty added four singles apiece, and “Captain Jack Boyle made a double and two singles, and besides stole three bases.”7 For Louisville, John Grim hit a home run over the left-field stands to account for two runs in the fourth inning. Tom Brown’s double in the sixth drove in the only other Colonels runs. When the game was finally finished, Colonels pitcher Jack Wadsworth’s “arm hung limp and the Louisville fielders’ tongues were hanging out, the result of their running after long hits.”8 Wadsworth walked three. Carsey also walked three and had the only strikeout of the game. It was the third victory in a row for the Phillies. It was the sixth game of a 28-game homestand, and they would win 10 in a row before tying the Cincinnati Reds on August 27. The 29-4 victory came after two severe beatings of the Colonels, by scores of 14-4 and 17-3. In the three games, Philadelphia scored 60 runs against Louisville. However, the Phillies could climb no higher than fourth place in the league. Meanwhile, the Colonels lost eight straight from August 15 to August 25, tied the New York Giants, and then lost 10 more games. From August 15 to the end of the season, Louisville sadly played to a record of 4-33-1, leaving the team in last place, 54 games behind the Baltimore Orioles. In 1894 Thompson led the league in slugging (.696) and RBIs (147), and his OPS for the season was 1.161. Thompson’s accomplishment marked the second cycle in Phillies history, after one the same season by teammate Lave Cross, who hit for the cycle on April 24 against the Brooklyn Bridegrooms. Other players to hit for the cycle in 1894 were Bill Hassamaer of the Washington Senators (June 13 against the St. Louis Brown Stockings) and Tom Parrott of the Cincinnati Reds (September 28 against the New York Giants). The box score12 is shown below. 1 Baseball-Reference.com shows an attendance of 1,250. The Louisville Courier-Journal said it was 1,200. 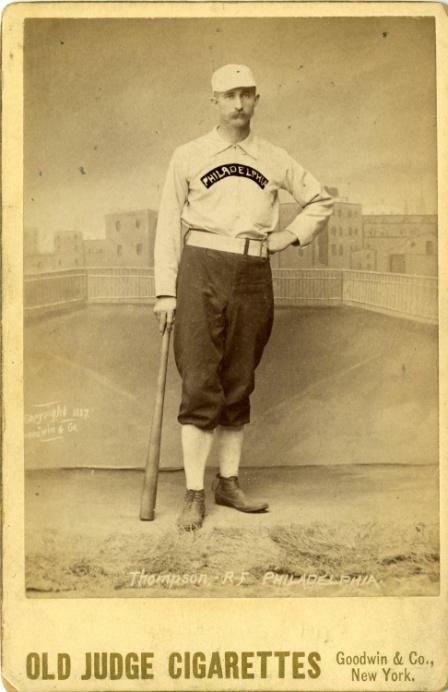 2 Don Thompson, “Sam Thompson,” http://sabr.org/bioproj/person/b3e0fab8. 3 “The Colonels Again Go Under,” Philadelphia Inquirer, August 18, 1894: 3. 4 “Weak Battery Work,” Courier-Journal, August 18, 1894: 2. 9 “Bad Judgment and Indifferent Work or Both Shown at Philadelphia,” Courier-Journal, August 18, 1894: 2. 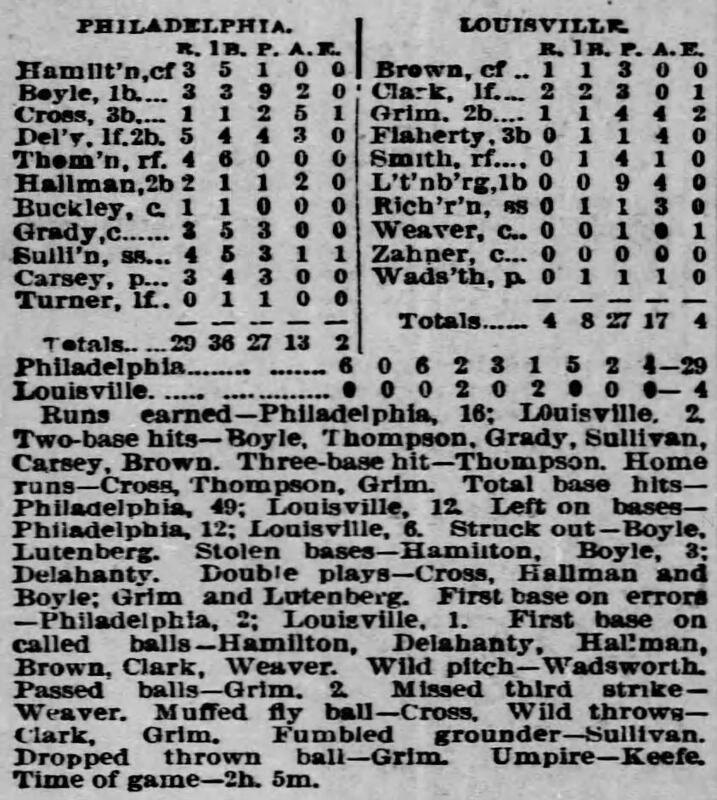 12 The box score was taken from the Philadelphia Inquirer, August 18, 1894: 3.